The Starry Night Hotel and Apartments. - Together, We Make Memories! The Starry Night Hotel and Apartments. Apparently, the only way to get to the rooms of the Starry Night Hotel and Apartments is via a flight of fancy, because try as we might, we were unable to locate such a place using all the power of Google's mighty search engine, and can only surmise that it was sourced from the imagination of its clever artist. She (or he) couldn't resist the temptation to add a very "punny" remark on the Marquee just below the lovely neon sign, stating "WE HAVE EAR-ILY LOW PRICES!" 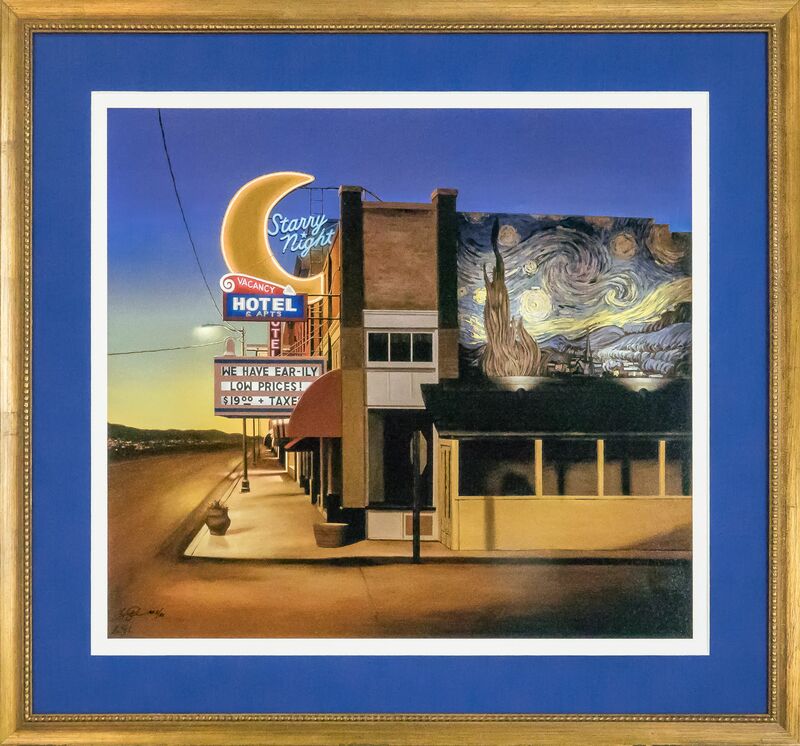 Coupled with a spotlit mural of Vincent's iconic painting, "The Starry Night" it becomes idiosyncratically compelling when coupled with the silent stillness of the street scene that accompanies it, almost as if Vincent ran into Edward Hopper on the way into a bar and this image represents the conversation that ensued.